"President Chandrika Bandaranaike Kumaratunga has pledged increased Governmental assistance towards building the cinema industry while hailing the efforts of the cinema artistes who recently brought fame and glory to Sri Lanka by their unique cinematic creations. This will certainly be music to the ears of those in the movie industry, especially directors and producers aspiring to make artistic films with different subject material. The very fact that the Presidential Film Awards ceremony was held after a lapse of four years highlights the Government's firm commitment to uplift the film industry. Indeed, State assistance is essential for the healthy development of the film industry. In this context, President Kumaratunga's pledge to increase budgetary allocations for the further development of the local film industry will be a boon to cinema artists." : BBC on the Sri Lankan Film industry - "Sri Lankan cinema is highly acclaimed abroad - its films have won dozens of awards at international festivals. Film makers tackle gritty subjects, including family relationships, abortion and the years of conflict between the military and Tamil Tiger rebels in the north. 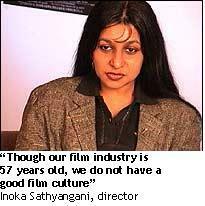 But if you visit a cinema in the capital, Colombo, you will be hard-pushed to find a local film on show." British-Sri Lankan rapper M.I.A. (real name Maya Arulpragasam) has been nominated for this year's Mercury prize going up against heavyweights such as Coldplay and Kaiser Chiefs. She is nominated for her debut album Arurlar and the £20K prize is usually given to emerging talent. Other desi winners included – Talvin Singh who won it in 1999, the same year that Nitin Sawhney was nominated. when she was nine and performs under the name M.I.A., is not like that. Anyone who has trolled through bins on Canal Street for videos of kung-fu movies or reggae mix tapes will recognize M.I.A. 's first single, "Galang" (2003), as an example of actual, on-the-ground world culture: synthetic, cheap, colorful, staticky with power. The beat is shuffling and abrasive, made from what sounds like the by-products of some other, more polite song. It most resembles Jamaican dancehall patterns, but with a twist. "Nobody wants to be dancing to political songs ... Every bit of music out there that's making it into the mainstream is really about nothing. I wanted to see if I could write songs about something important and make it sound like nothing. Nicholas B. Dirks: Castes of Mind: Colonialism and the Making of Modern India.